Kids are all innately different; some are daredevils, others more quiet and introspective. Some create imaginary environments from their surroundings, while others try to conquer whatever is close by. Nature play and climbing provide opportunities for both by being both athletic challenges and adventure filled landscapes. Children also crave unique and compelling environments. Just like an adult in a cubicle, children recognize the encroaching sameness of the spaces we live and work in. Sculptural climbing gives designers the opportunity to make each play space unique with its own special nuance. 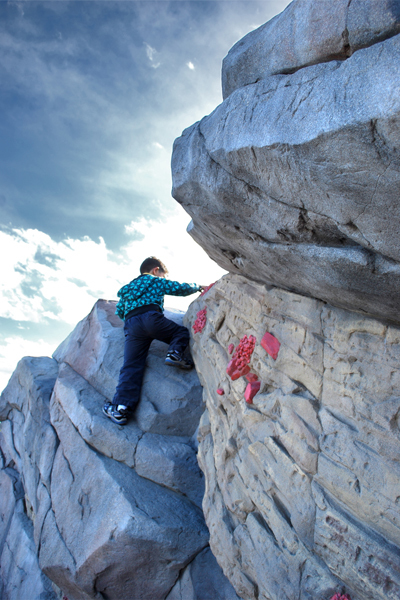 Climbing sculptures provide that diversity of experience by combining physical and mental challenges. Manufacturers of custom play sculptures consider the physical activity to be only one component of a well-designed play feature. Each piece should provide aesthetic and sensory aspects that give children and adults a foothold into imaginary landscapes and act as a canvas for their imagination. As those in the playground industry know, most structures have a life expectancy of 20 years or less. Aesthetic tastes change, user groups change, and children exhaust the play value of traditional structures. What was once a source of pride for the community quickly becomes destined for the landfill. This life expectancy is contrary to the general trend of the construction industry, which is to design for lasting durability. Playgrounds should be timeless by offering opportunities for ever increasing challenges. 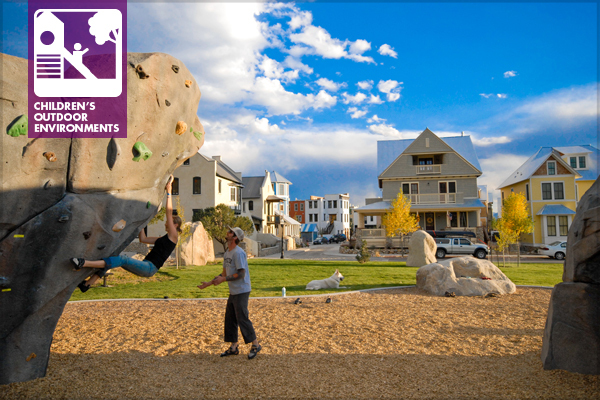 A well-designed playground climbing feature should include routes for all types, ranging from scrambles for young children to advanced over hanging problems for adults. As skills and strength grow, so should the challenge. For most climbers, climbing is a lifelong sport. One of the joys of rock climbing is that you can spend your entire life as a climber and never master the sport; in fact, few ever do. Because climbing has become safer, younger children are being introduced to the sport by their parents, making it a sport that multiple generations can enjoy together. Climbing, by its nature, combines physical power with mental fortitude. It builds strength, resolve, and control. Climbers tend to have an uncanny awareness of the body and movements, using efficiency of motion to overcome physical challenges. Rock climbing increases aerobic and anaerobic endurance, strength, and flexibility. According to The Outdoor Athlete, climbing short, steep, and over- hanging routes enhances anaerobic endurance, while climbing longer, sustained routes promotes aerobic endurance. Both aerobic and anaerobic exercises improve cardiovascular function and body composition. The process of climbing itself involves stretching your limbs to reach hand and foot holds, increasing strength and flexibility. Physical and mental strength are not the only benefit of climbing. You also can enjoy a reduction in stress and stronger emotional health. Many people feel a sense of peace and freedom from everyday pressures when participating in activities that bring them closer to nature. As a climber, you are forced to look at a route at every scale, assessing both the overall strategy and individual handholds, down to the minute texture of the rock. Artificial rock brings that intense scrutiny to the playground, building essential problem solving skills. As playgrounds have become standardized, synthetic materials have proliferated. Meanwhile, our affinity for natural materials and its effect on wellbeing has been documented in a variety of other fields such as health care and office work spaces. Well-designed climbing sculptures bring the textures and materials of nature back to the controlled environment of the playground by creating connections to the outside world. 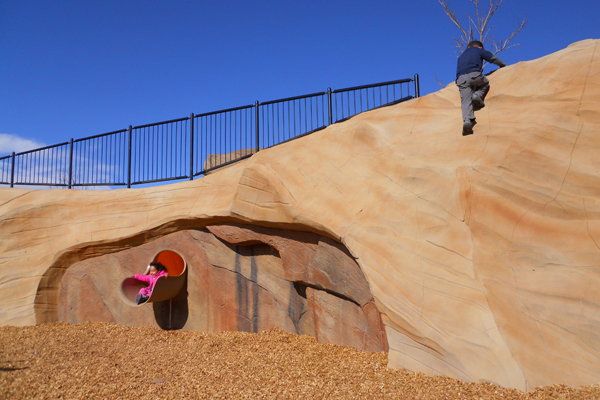 Material and sculptural advances in artificial rock fabrication mean that playground users can experience actual geology, feel the warmth of rock, and explore its layers of detail. Founded in 2005, Integrated Design Solutions (IDS) designs and fabricates custom sculptural landscapes and play features using a specially formulated polymer concrete shell that provides a durable, realistic surface suitable for both indoor and outdoor use. Driven to increase the play and climbing value of artificial rock, IDS has pioneered new material and sculptural techniques that bring an unprecedented level of realism to the market.